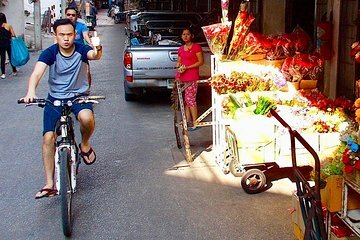 Explore the back streets and local communities of Bangkok by bike during this half-day cultural tour of the city. Follow your local guide through Chinatown, explore colorful flower markets, navigate ancient Chao Phraya River and get an insider's look at the former capital of Thailand. This easy-going tour is the perfect way to see the sites and landmarks of Bangkok. Wow, I felt like is was in a movie biking the back alleys of China Town! I thoroughly enjoyed this experience. Teddy as in bear, was a great guide, sharing information along the way and was invested in my having the best experience possible. We went to many venues and each one was made more enriched by Teddy sharing his knowledge. The pace was perfect, and we wound up spending a bit more time than the tour was scheduled for because there was no rush on Teddy's part. We sampled a variety of food along the way, and all of it was good. The tour ended with fish cleaning my feet while I sipped on a drink. I got to experience Bangkok in a very unique way that provides a lasting memory. This is really a great trip! You need to be able to ride a bike as you are going down paths and corridors and neat places you would normally never knew existed. Our guide was enthusiastic, careful, attentive, thoughtful--everything you want in a great guide. He knew things you want a guide to know. Teddy! Great Job!! This was a fantastic insight to a multi-cultural city. The guide was very polite and knowledgable. The place is a little hard to find so definitely print the map up but the company is well run with good equipment. The ice cream and fish foot spa was a lovely treat at the end! If you are an experienced cyclist and you want to see the city from a different perspective this trip is for you. The local bike shop that puts on this tour sent great instructions on how to find their bike shop where the tour starts be sure to print off the instructions they send. Prior to the ride a humorous and informative safety video is shown to acclimate participants on what they should expect. Helmets and water are provided and they ensure the bike is set up properly. I joined up with two others for the ride led by Kiki. The route takes a path including backstreets, sidewalks, bike paths, bike lanes, and through market areas. You see Chinatown, three Buddhist temples including both Chinese and Thai, the river front area, the river via ferry boat rides, and the Thonburi area. Kiki did a great job leading us through the city traffic. Good bike handling skills are necessary as some of the paths are pretty tight and congested with many pedestrians. Kiki relayed quite a bit of informative information about the temples and Thai culture. Some light snacks and drinks were also provided along the route. I thoroughly enjoyed the experience and recommend this tour. The guide was outstanding. This was a chance to get some exercise while on vacation. We did the late afternoon trip so the tour ended after it got dark. Was a bit nervous riding the bike down the main streets we had to go on but we survived without incident. Also rode down back streets and alley ways which provided a glimpse of how the locals live. The tour featured stops at several points of interest we had not hit with our other tours like the Flower Market. The guide was very good at making sure we were safe and okay to ride the distance. We even survived the downpour just before the end of the tour. It was well worth the time and money. This was a great sightseeing tour for Bangkok with a twist. Cycling through the alleyways and main streets made me feel like i got to see various aspects of life here and see firsthand the diversity in this city. Were able to see many temples and try different snacks in the flower market. Excellent trip.....huge fun and interesting!